In Need of a Nap? Steven (Chicagoland, United States) on 9 March 2017 in Animal & Insect and Portfolio. Leopard spotted at the Brookfield Zoo in Brookfield, Illinois. Photo captured April 10, 2010. Cette belle langue rose quelle vue super. Naps are always very good thing. Wow, impressive! I like how the red tongue sticks out! 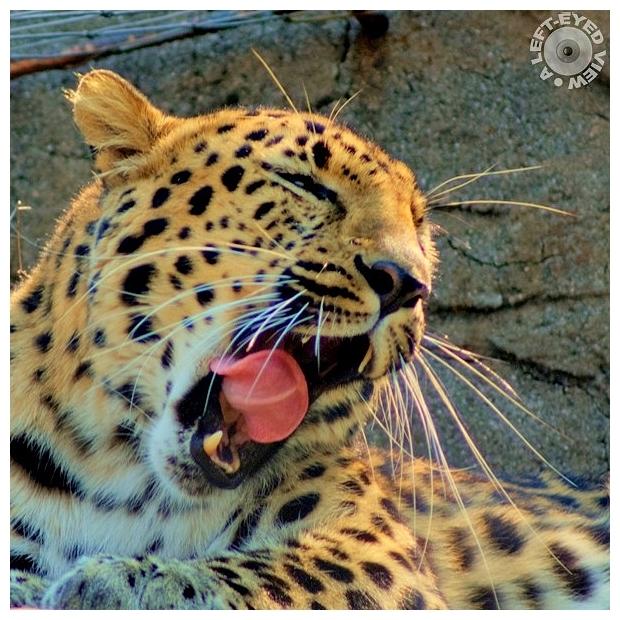 Kudos for "leopard spotted at..." wit, and this very nicely framed image of a beautiful animal. Great capture of his expression !! je le pense bien Steven.. I barely saw the photo, I also yawned. Apparently it's really contagious. Great capture of his expression. Perfect timing. Wow, what a cool capture! Great timing. Needs a nap or maybe wants to taste a delicious photographer. What a fantastic shot! Great timing on this beautiful photo! wow...what a brilliant capture !! Superb pose and details !! That tongue is simply fantastic ! Great timely image. Original expression. ...and Conratulations on your Spotlight ! Congratulations, Steven! A very fitting choice for the Spotlight indeed! . . a snack and a nap . . Congrats on the Spotlight ! Excellent capture of this gesture ... What a beautiful feline !!! Congratulations on the C. Spotlight, Steven !!! speriamo che non abbia troppa fame!